Argan Oil is my best friend. I use more than a little bit of Argan Oil daily, a few times a day actually. I use the pure oil on my hair, skin, and nails. 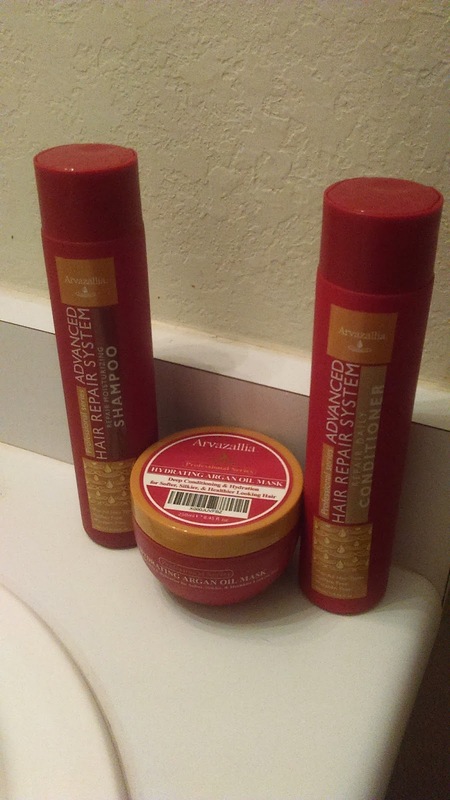 Now, I've been lucky enough to actually receive this set of hair repair shampoo, conditioner,and hair mask that contains both Argan Oil and Macadamia Oil in it. I've heard great things about Macadamia Oil as well. I like the look to the bottles. Pretty colors and nice slim size. I hate really oversized shampoos and conditioners that can barely fit on my shower shelves. These fit just fine. The scent is nice and light, glad it isn't too strong. It's a pleasant scent. I don't like to use shampoo too often on my curls but I decided to give the whole set a try. The shampoo lathers up well. I used it a couple of times, waiting till my hair was actually dirty, to get it extra clean. I then proceeded to use the conditioner, and left it on for a few minutes, like I do with practically all conditioners. Then I rinsed it all out and applied the hair mask. I'm very into trying new hair masks and giving my hair a nice treatment once a week or every other. I used this mask, and shaved my legs while I let it sit. Then I rinsed it out after about 8-10 minutes. When I rinsed my hair, I noticed how nice it felt and looked. Alright, so I did like the results, but I've noticed that my hair looks it's best when I only use the conditioner alone, or condition and then use the mask once in a while. The shampoo is really only necessary on my hair when I feel it's too dirty. Overall, the products are all very promising and yes I recommend, especially if you have curly hair, similar to mine. Learn more about this product line here.